There is a whole world out there, in the dense Sal forests of Kanha. A world far removed from you and me. Fascinating stories dwell here just like in the human world. Wildlife and nature peacefully co-exist, and mankind meddles. For better and for worse. These snippets attempt to look beyond what we witness on jungle safaris, and try to capture the essence of life in the wild. 1. I will follow you into the dark. When we spot a pair of jackals run off into the fields of Kanha, our naturalist can’t help but speak of their love. Jackals lead monogamous lives, and once they find a mate, it’s till death do them apart. In a jungle like Kanha, with predators as fierce as the tiger and as illusive as the leopard, life is tough. Yet if a mate dies, the survivor refuses to take on another mate, leads a solitary life, and eventually succumbs to grief. Who would’ve counted these scavengers among the romantics? A pair of jackals running into the fields. 2. Keep off the grass. I have to admit I didn’t care much about spotting Barasinghas in Kanha National Park, until I heard that this is the ONLY place in the world they are found! Watching the black and golden-bodied males with velvet antlers, our naturalist lamented about them being endangered species. The villages within the national park would let their cattle lose, who fed on grass all day. Unlike other species of deer, the Barasinghas only feed on a specific type of grass, which the cattle wiped out. The destruction of their natural habitat led to a fast decrease in their numbers, down to a meagre 600. The forest department has now relocated the villages, and is trying to redevelop the grasslands. 3. The need for speed. Zooming on our safari jeep along the paved road in the buffer zone of Kanha National Park, our Aussie companions noticed a couple of cows sniffing a small body on the road. We reversed the car, and found a dead palm civet; the victim of a road kill. It’s a perpetual conflict in these areas; you need paved roads to ease transportation of goods, and to aid the forest department in curbing poaching and protecting the wildlife habitat (Read: Wildlife Tourism: Are We Saving The Tiger?). That means an obvious intrusion in this forested terrain and unintentional, untimely deaths of wild animals, like this beautiful civet. May her soul rest in peace. A dead palm civet; may she rest in peace. 4. The misogyny of creation. When we think of tigers, we only think of majestic creatures that fear nothing. What moved me was hearing that once tigers mate, the male leaves the impregnated female to fend for herself. She must hunt even 4-5 days before the cubs are born, after which she retires deep into the forest or in a cave to deliver. For the next three months, she hunts to feed herself and the cubs, and must protect them from male tigers, including the father, who often kills them for fear of a powerful competitor. Is that proof that misogyny is at the very core of creation or am I being too dramatic? A glimpse of a tigress, in Kanha National Park. 5. A computer engineer in the forest? Meet a computer engineer turned naturalist, Chinmay, at Kanha Earth Lodge. His tryst with the wild started when he became the go-to guy to rescue snakes from the houses of villagers; his promise was to get the snakes out of the house alive and save them the curse of killing these mythological creatures. He’s fought “snake charmers”, who he mentions fool people by forcibly removing the venom gland of snakes and force-feeding them raw eggs through a tube to keep them alive (why were we never taught that in school?). He’s even survived a cobra bite, but that’s a story you have to hear in person. He then fought everyone who told him he couldn’t make a living off his passion for the wild. Have you been to Kanha or any other forests in India? What fascinating stories have you discovered about life in the wild? Settling in for dinner with our naturalists, at Kanha Earth Lodge. Note: My trip to Kanha was made possible by Pugdundee Safaris and Kanha Earth Lodge. Opinions are always my own. I wonder: if the safari jeeps and other vehicles stopped “zooming” and instead ambled along at a calmer pace, might more civets and other animals make it across the road? Of course, but the trouble is regulating that, especially in the wee hours of the night. 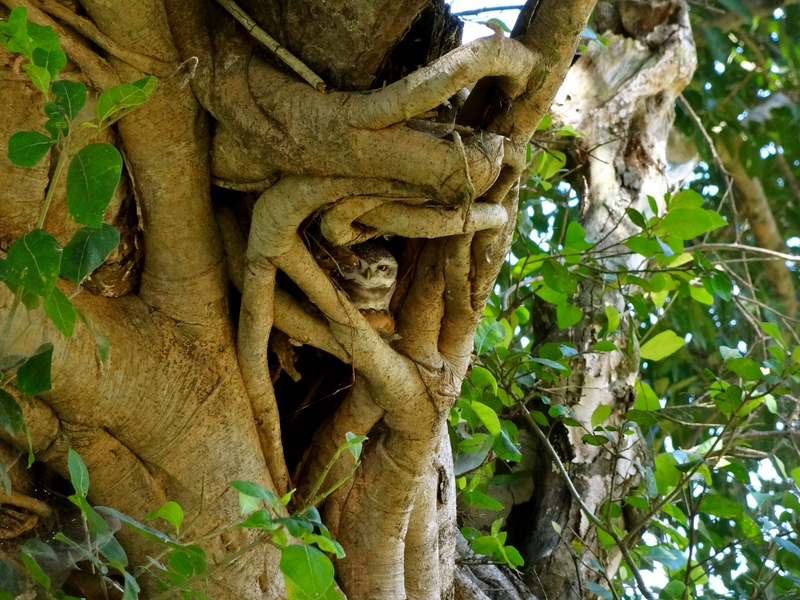 hey, nice one shivya, I am not able to zoom in the 1st pic of ur blog….is it a owl sitting on the tree ?? It indeed is, Pushkar. Such a cute fellow it was! We were able to see only 2, but apparently they’re a different family from the 7. Hope they grow in numbers too! Never been to India yet, but you will be the first or second to know lol. But wild life stories I can share in abundance having grown up in the country in Australia. Be it from domesticated or wild life. I think the most interesting one though, was the struggle between my cat Rambo (read giant tiger in a large muscular house cat body) and a very poisonous black snake. Great article there young lady. I am proud of and inspired by you on a daily basis. Whoa, that’s a fight I wouldn’t have wanted to witness! Looking forward to your stories on breeding horses. Come soon. Beautiful post, Shivya, and fascinating tales indeed. Thanks 🙂 I’m sure you have so many of your own from Kanha! Nice Post!! I’m planning to visit Kanha next week. Would appreciate if you could provide some useful tips for lodging and boarding. Thanks! How do You find Chinmay? I would like to go on few days vacation during june this year with my family.Place should be in Madhya Pradesh having natural beauty and wildlife.Also a treat in summers. Very well articulated post. I am planning to send my parents on a holiday to kanha. do you have any idea about some good places to live there? how about Banjar Tola ?Do you have any idea about the same? Following your blog lately , It is so illustrative that I can actually sense and feel that whole aura around me . Previous Post2 Months on The Road: Highs and Lows. Next PostAuroville: Utopia or Something Like It.